We used the money to cover Salsa’s adoption fee of $200 and the estimated cost of her heart medication, which is $190. Salsa and her bonded pal, Dudley, were adopted on Jan. 22, 2019. She had been with NMDR since 2014! It helped our organization cover a portion of the cost of rescue and care for Salsa. Any time a gift or grant is received, it gives our mission a lift so that we can keep going back for more discarded mill dogs. 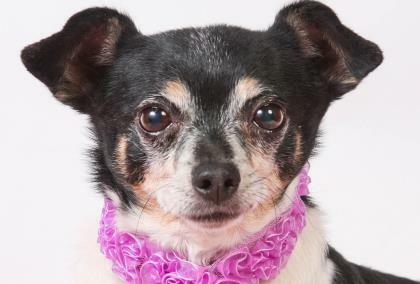 It also helped her adopter make a decision to take her home, knowing the cost of her medication would be covered and the adoption fee was waived. Every incentive helps move our precious dogs to happy homes. 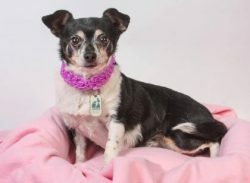 For inexplicable reasons, Salsa was one of the least viewed dogs on our and Petfinder’s websites. She was simply passed over in favor of other dogs. But when Angie Morrissey of Longmont, Colo., and her two children decided they wanted Dudley, they couldn’t bear to adopt him without Salsa, who was so dependent on him for her security. Because Salsa was not their first choice, it really helped the family make the decision to take her when they learned there would be no adoption fee and the cost of her heart medication would be covered for the rest of her life! Thank you, Petfinder Foundation, for helping Salsa find her forever home.